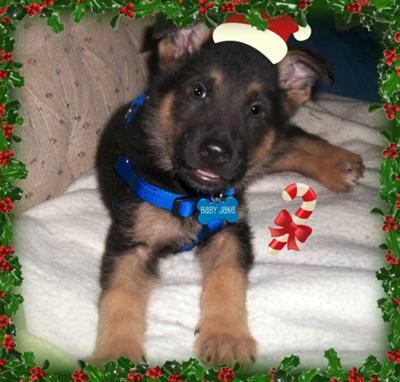 I got Jake as an early Christmas present about two weeks ago on December 3, 2010 at eight weeks old. He has been the most wonderful thing I could ever imagine! 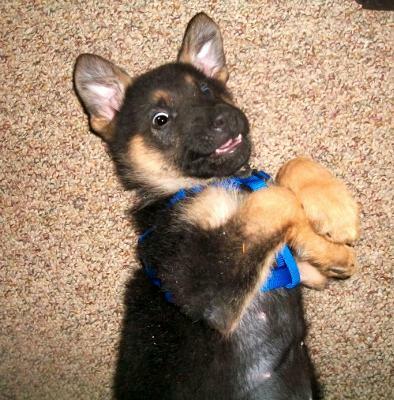 You see, I've wanted a German shepherd for over four years now, and finally my dream has come true. Jake is a very smart puppy who already knows sit, down, paw, spin, and comes when called (most of the time!) We are going to start "stay" as soon as I get off of school for Christmas break! Jake is a very rambunctious puppy who loves to bark and chase our three cats. 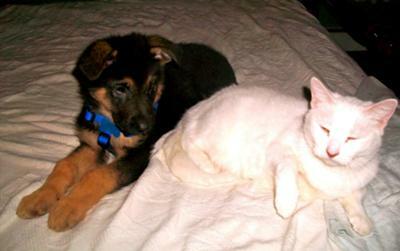 Only one of them, a pure white one named Powder, actually plays with him though. She allows Jake to bark and jump around her and only occasionally gets annoyed and swats at him, but she never uses her claw. Her swatting at him just makes Jake want to play even more. He can also be pretty sassy, barking at me when I make him do a trick, but don't give him a treat. We are currently working on this "sassiness", and hopefully he will learn soon that he doesn't always get a treat when he does something good. Jake also likes to play fetch with empty water bottles and tug with one of my field hockey socks. He also ADORES greenies, but I have to hold them while he chews because I am deathly afraid that he will try to swallow a big chunk and choke. As you can see, Jake is a very silly puppy. Weighing 14 pounds at ten weeks, that is apparently very underweight for a large boned - or any GSD pup - at this age. The breeder told us that she only breeds LARGE BONED, and that they were from German lines, so I don't know if she was lying, or if he was just the runt and didn't get much mommy milk. When we first brought him home he was about 7, and then 9.1 at 9 weeks. Now he has gained 5 pounds, but he is still considered very underweight.... as you can see in his pictures, he does not appear underweight at all! Maybe he is just little, but that doesn't bother me one bit! I was hoping for a very large boy(maybe reaching over 100 pounds), but if not, I will love him just the same! I hope you agree that Jake is amazing, just the way he is! 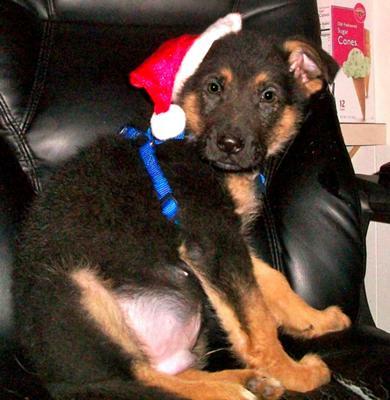 Comments for Oh the Mighty Jakey German Shepherd Puppy! Jake is a real cutie and I'm sure he'll be a very handsome guy when he grows up. Don't fret over him being small. Even an 80lb GSD is a big dog. He'll probably be super fast and very agile. Plus, the less weight he carries throughout his life, the better off his hips & joints will be in his senior years. You have the CUTEST puppy EVERR!